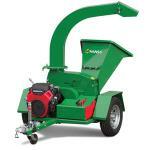 The powerful hydraulic feed system of the Model C40 makes it easy to process any material. 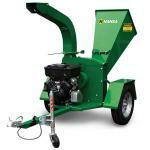 Its 7” x 13” wide feed opening pulls bushy and twisted branches with forks into the machine without effort. You simply control the feedrate with the control bar and the rest is automatic with the electronic automatic sensor feed system. 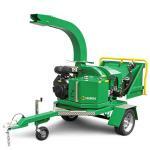 Ideal for professional use by arborists, parks & reserves, local bodies, orchards and hire centres. 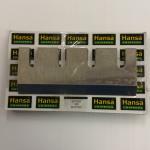 Wide Infeed Opening: 330 x 178mm (13” x 7”). 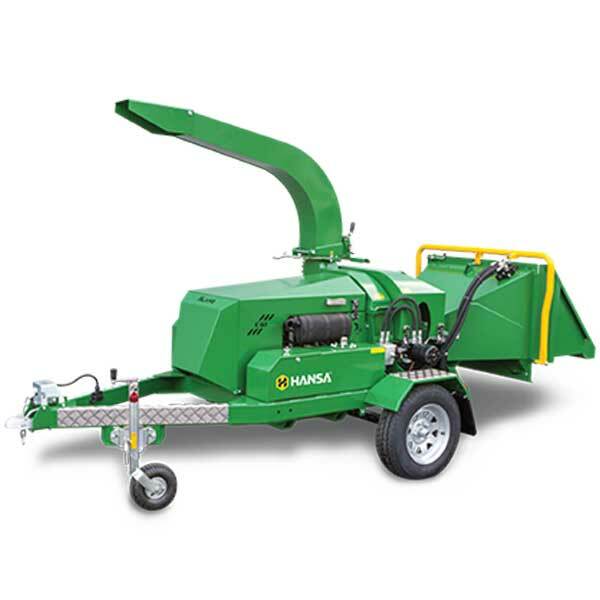 For foliage and brushy material, this wide infeed opening gives the chipper a capacity of a 10” to 12” machine with all the advantages of a 7” machine, e.g. Low weight and cost, and easy to manouvre. Vertical Anvil: Anvil positioned vertically (rather than horizontally) to reduce knife damage caused by abrasive material. Hydraulic Pump: Driven off the engine. Even if cutting disk is jammed, the feed roller can still be reversed for clearing the branch material. Clutch: Easy starting with soft start technology. Simple and reliable. Auto tensioning belt drive system. Outlet: 360° rotating chute with deflector and a positive locking system. No tools required for adjustments. Jockey Wheel: Large solid dual wheels, height adjustable. Light System: LED tail, brake and license plate lights, suitable for 12 or 24 volt system. Feed Roller: Pivot type spring tensioned, operates with less friction, moves up to within 10mm of knives. Feed Control Bar: Pull to feed, push for reverse. Feed Table: Folds away and is locked when transporting the machine. 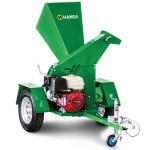 Auto Sensor Feed: Electronically monitors engine RPM and controls feed roller to suit. Auto feed is operator adjustable by push button, LCD screen displays engine RPM & hour meter. Auto reversing for quicker engine recovery. Feedroller jams are reversed and cleared automatically, eliminating manual reversing of feedroller if a blockage occurs. Finish: Media blasted surface, zinc shielded and powdercoated (Hansa green or optional colour of your choice). Warranty: 12 month warranty (conditions apply).